To achieve this it was ’empowered’ to mount exhibitions, collect photographic works, promote photography and provide public facilities for the pursuit of photography. The journey began. The team that brought the Cambridge Darkroom to fruition where Mark Lumley, Pavel Büchler, Roy Hammans and Brian Human. 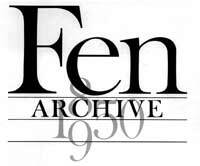 The founding directors of the company were Roy Hammans, Brian Human, Colen Lumley, Peter Soar and Edward Wright. Colen Lumley, an architect, advised on the design of the gallery space and Peter Soar, a local solicitor, provided legal advice and services – both had an active interest in photography and were keen supporters of the venture. Edward Wright brought his wealth of experience in design and teaching to the mix. The ‘board of directors’ met the legal requirements for a limited company and managed the company affairs. 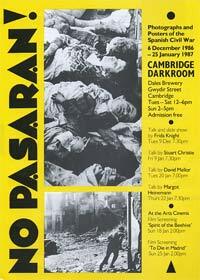 The Cambridge Darkroom Gallery opened on the first floor of Dales Brewery on 20th January 1984, with Mark Lumley as Director and Pavel Büchler as Co-Director. 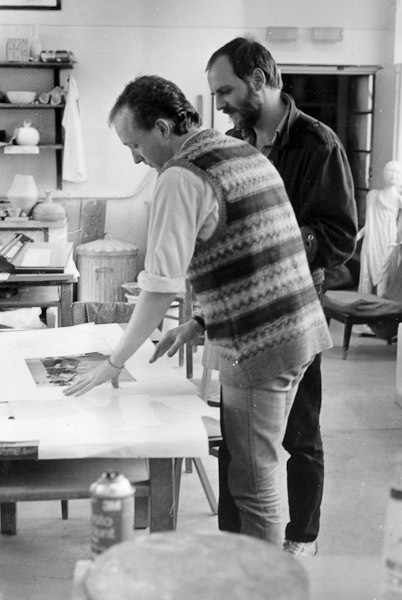 The Gallery Director and Co-director were the public face of the Darkroom; it was Mark and Pavel’s job to formulate and manage the programme – and to sustain it. The premises comprised 132 sq m of main gallery space, a spacious entrance stairway with room for small exhibitions, two darkrooms for processing and printing, a layout/office area and a reception/sales desk. The eclectic mix of artists represented included among others: Jane Bown, Bill Brandt, Victor Burgin, John Davies, Fay Godwin, Brian Griffin, Sam Haskins, Paul Hill, Sharon Kivland, Mari Mahr, Angus McBean, Jo Spence, Chris Steele-Perkins,and Peter Turner. Many of them produced material specially for the show. A Darkroom-curated exhibition, the Sky Show, bringing together the work of five invited artists and photographers whose work demonstrated a specific use or interest in the sky, either in a conceptual sense or in the more traditional relationship to landscape. 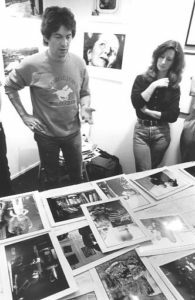 The first Darkroom Open Show, Sequences, which focused on the use of sequential imagery in photography or in photography-related media. The artists whose work was featured included among others Sharon Kivland, Paddy Summerfield, Susan Trangmar and Helen Underwood. There were talks by Peter Turner, Gene Nocon, Chris Welsby, Roger Palmer and John Davies. A weekend residential workshop on Colour in Photography at Burwell House with Hock Khoe; regular Beginners’ Workshops; and a residential workshop at Paul Hill’s Photographers’ Place in Derbyshire. This programme set the tone for the next five years – the Darkroom was well on its way to becoming the photographic hub of Eastern England. The Gallery mounted around eight major shows a year in the main exhibition space and numerous small shows in the stairway. 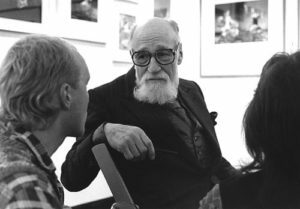 Travelling shows featured the work of Joseph Koudelka, Mario Giacomelli, Marco de Valdiva, Jo Spence, Angus McBean, Paul Tanqueray, Fay Godwin, Duane Michals, Keith Arnatt, David Goldblatt, Richard Ross, Bernard Faucon, Roger Palmer, Georges Rousse, Craigie Horsfield, Eadweard Muybridge and John Goto. Brian Harris and Carola Rush, during Brian’s gallery workshop session. 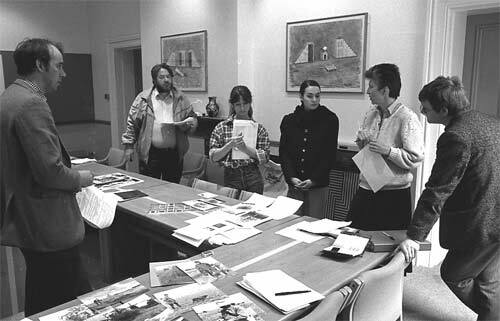 Group and thematic exhibitions initiated by the Darkroom included Revisions, Fen Archive, Next: Tomorrow (with Kettle’s Yard, Cambridge), Boundaries (the first Darkroom Bursary Show, 1987), Figures, Death (with Kettle’s Yard) and Shifting Focus (with Kettle’s Yard). Other thematic shows included Tierra y Libertad, No Pasaran, Remnants of the Authentic (German photographic art of the 1980s) and Photography in the Weimar Republic. The work shown was not confined to two-dimensional pictures on walls: semi-sculptural pieces were included and there were installations by artists such as Andrea Fisher, Helen Underwood and Marysia Lewandowska. Film, video, dance, music, poetry and performance were also presented in the gallery. Artists, writers and others involved in photography or photographic practice gave talks, including Jo Spence, Ian Jeffrey, Angus McBean, Olivier Richon, Keith Arnatt, Victor Burgin, David Mellor, Thomas Joshua Cooper, Zelda Cheatle, Craigie Horsfield and Brian Harris. Adrian Plant and Dave Runnacles preparing prints for exhibition. The Darkroom continued its popular Beginners’ Workshops and diversified into themed workshops (for example Self Image, Telling Tales, Landscape), Open Evenings and discussions, children’s workshops, colour work, tape-slide work, teachers’ workshops and video production. The workshops helped to maintain the Darkroom’s connections with the Cambridge community, as did exhibitions such as the ‘Ditton Fields Project‘, work from the Cambridgeshire College of Arts and Technology and small exhibitions on the stairway by local artists. In August 1986, Pavel Büchler resigned as Co-Director to pursue his own work and very soon to take up a teaching post in Glasgow. 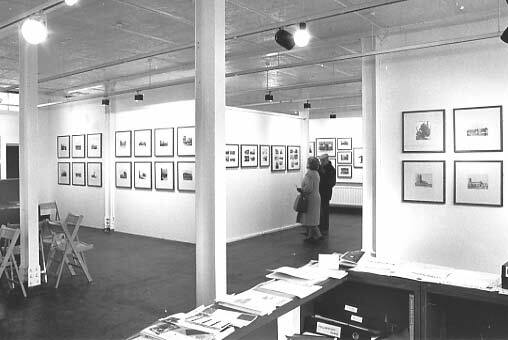 In only two years the Darkroom had established its reputation as an innovative and dynamic gallery, and was now self-sustaining – albeit still reliant on grant-aid and public subsidy. After five years of intense dedication to his role as Gallery Director, Mark Lumley left in October 1989. Carola Rush, the Education Officer, took over the by now well-established facility as Acting Director.